As many of you know, Mike and I are gearing towards a lifestyle of minimal waste. We started with the obvious and easiest- recycling, investing in reusable straws, and swapping the plastic in our home for things such as bamboo toothbrushes and sustainable razors. And while we understand that to truly be of “no waste,” one must either be dead or nonexistent, we’re slowly, but surely eliminating all things harmful to the environment or unsustainable from our house. And it's been feeling so good! This is EXCITING! 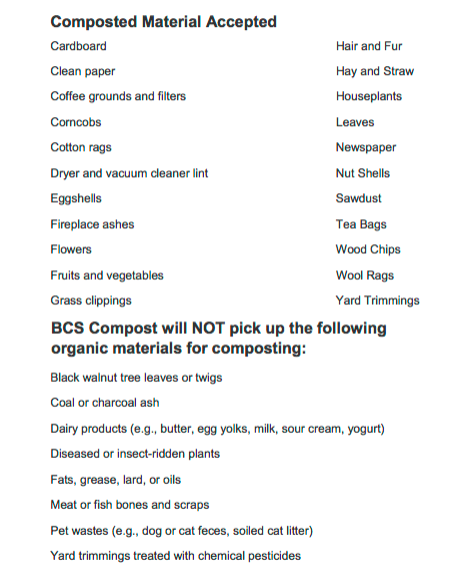 I've been trying to find a way to start composting for a long time with no luck. We live in a big old house that has been transformed into a couple small apartments, so we don't have the access to a community garden, let alone our own garden (I can't wait to have my own damn garden!). So you can imagine my disappointment when I started filling a compost bowl, only to realize I had nowhere to empty it :( I believe the universe truly is always listening, because I recently met somebody who not only owns his own composting business, but supplies us with a bucket AND picks it up once a week to bring the compost to community gardens, etc. It's definitely been a game changer. We've been filling up the compost bucket and recycling can long before the trash gets full and that's pretty damn cool. Composting is just the process of turning organic matter (that we’d otherwise dispose of) into something beneficial. Organic materials like veggies, egg shells, coffee grinds, tea bags, etc. (things that are NOT animal based) are put in a composting container to decompose and overtime, turn into a rich form of soil that’s chock full of vitamins to help you grow amazing plants! Composting helps reduce the amount of waste being directed to our landfills AND cuts down the usage of chemical fertilizers. We've eliminated the use of plastic wrap and bags entirely. With the amount of smoothies we make, we constantly have half cut lemons, bananas and avocados to keep fresh. If we used plastic wrap to do it, we'd be drowning in the stuff. So, we swapped it for these Outback Collective reusable food warp organizers. (Heard of Abeego wrap? It’s the same concept, only derived from plants instead of bee’s wax) and haven't missed it for a second. Our food actually stays fresher this way, so it's a double win! We started swapping our plastic tupperware for glass mason jars- not only are these soo much easier to keep clean and organized (the most stressful part of my day used to be finding the matching lid to a tupperware container), but the less plastic we all invest in, the better. I mentioned these in my 3 Beauty Products I'm Living For This Summer post, however it's worth mentioning again just how impactful it would be if we all agreed to ditch our plastic bottled shampoo and invest in a couple of these babies! Not only are there multiple options for fragrance and hair type, but they last for up to 80 washes and only cost $10-$12. My favorites are Lullaby and Trichomania. Check them out here. 1. Is this something we genuinely need? 3. Will this item solve a re-occuring problem? The less unnecessary spending/buying, the less waste we'll be contributing to our planet. Navigating towards a more minimalist lifestyle has been beneficial not only in our quest to soften our footprint on Earth, but all areas of our lives. So there's a quick update on our journey to going minimal waste. I’m proud of us! Doing our part in the mission to protect our planet and its inhabitants is super rewarding, and if you’re taking steps towards a more Earth-friendly lifestyle as well, yay! Making sustainable and ethical decisions will make you feel EMPOWERED. But do yourself a huge favor and take the pressure off- we don’t need to be perfect, 100% no waste super humans. Remember it’s all about progression, not perfection. We’re all doing the best we can. If you want to get started on your sustainable living journey- pause now and reflect on your waste habits. Are there any small changes you can make today? If you have questions or curiosities, please don’t hesitate to shoot me a DM over on the gram and we can chat it up!